B. Thomas (Arlington, Texas, United States) on 22 July 2011 in Plant & Nature. Cactus blooms in Big Bend National Park. @Marie LC: Thanks, Marie. It is a contrast between the two. This flower is well protected. Beautiful colours and the light is amazing! @Don Levesque: Nature takes care of things. Thanks, Don. A very beautiful cactus flower with wonderful colours and texture. A beautiful capture. Wonderful shot!! The detail, color and texture are all great. I remember years ago when my brother-in-law picked me some cactus berries. I was skeptical to try them but they are wonderful. Maybe theses lovely flowers will soon become that elusive treat. @Candais: Really? I have never heard of that. Very interesting. Beautiful color and detail. I presume this was taken in spring? @Julie Brown: Yes, Julie, right now Big Bend would have killer heat, and I'm not a big fan of the desert anyway. The Big Bend photos were all taken in March which I guess would be considered spring down there. @Eric Cousineau: So true. Thanks, Eric. @Denny Jump Photo: Denny, I should not have said I'm not a big fan of the desert. I do like it, and really loved the time we spent in Big Bend. It's just that I love the mountains, forest, rivers, streams and waterfalls, and wildlife that live there so much. I like the ocean a lot too, but have not spent as much time there as the mountains. And you are right, the more I've been in the desert, the more I do appreciate it. Thanks, glad you like the shot. I've learned the hard way not to mess with those inviting flowers. The do make a pretty picture though. Such a beautiful blossom ... and one on the way; you captured this beautifully. There's a whole other 'world' inside these flowers and your detailed shot shows just that! @Judy aka L@dybug: Thanks, Judy. Beautiful and daring...wonderful blossom and buds! 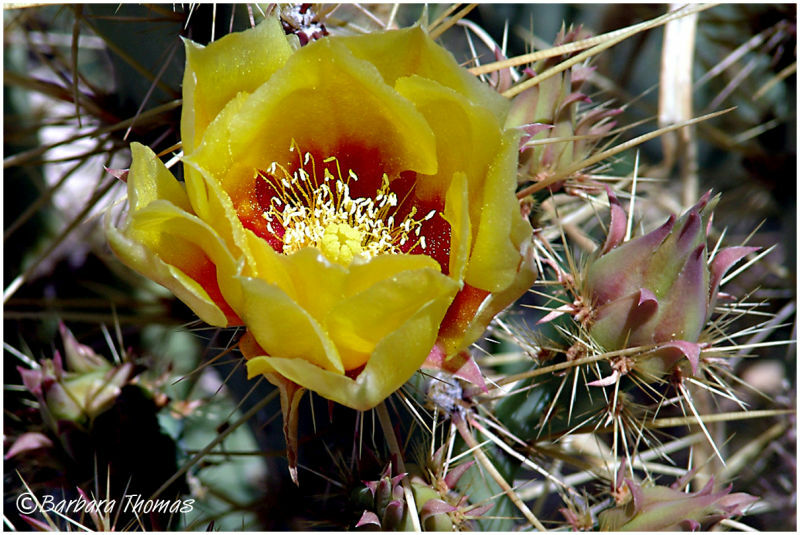 Beautiful blossom off this cactus that you've captured! who would think of picking this lovely flower, guarded as it is by these intimidating thorns?!? ;-)) beautiful to look at, barbara! I don't like cactus, generally...but when they bloom in such gorgeous colours...I pay attention! @Japanalia: It's hard to miss them when they are about the only flower around.